For a few years, we (we meaning Brigette) had a White Garden going at the Inn on Mill Creek B&B near the Mountain Laurel Room. A White Garden is the kind of garden that has only white blooming flowers and white or silver foliage plants. So, for example, we have white shasta daisies, white astilbe, white daffodils, white lilies, white irises, white roses, a white butterfly bush…and so on. It’s a nice garden space. Pretty. But limiting. In thinking about how we could keep the garden interesting as time went on, we came across a near-black flower version of a white flower we were already using in the garden. Voila. Light bulb moment. Why not a Black & White Garden? Yes. We’re now in Year 2 of transforming the White Garden into the Black & White Garden, which now features not only white blooming flowers and plants with white/silver foliage, but flowers that are black or near-black, as well as plants that have dark foliage. 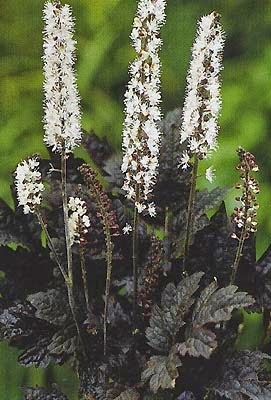 “Black Beauty” Cimicifuga – This is a tall, dramatic-looking plant that has black foliage. It’s white flowers bloom in late summer. Butterfly friendly and fragrant? Awesome. Deer and rabbit resistant? Yes, please. Black and white? Well, that settles it. This plant is perfect for our garden. We are getting one baby-sized, of course, so it will be fun to watch it grow up in the garden. “Turkish Delight” Sedum – sedums (stonecrop) are one of our favorite plants. You’ll see them in sunny garden spaces all over the Inn on Mill Creek B&B. 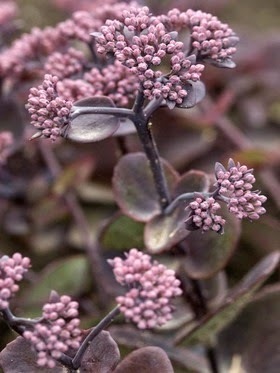 The kind of plant that provides four-season interest, sedums are tough and pretty. They show up in spring with clusters of leaves that form a mound in summertime, and then by mid- to late summer and into fall, they have small flower clusters, which dry and create a little bit of winter interest in the garden. There are so many varieties out there now, and “Turkish Delight” is a great fit for the Black & White Garden at the Inn. It has dark purple/burgundy foliage, almost black. And it’s a dwarf variety, so it can be tucked easily in front of the shasta daisies to create nice contrast. Other additions this year includes white flowering hostas and dark and light leafed coral bells to fill in a shady area.